"This Pate of Chicken Livers is one of the closest approximations of a Strasbourg pate de foie gras ever devised. It has a quality and distinction all its own. It is easy to make, keeps well and may be frozen quite successfully." Adapted from "Michael Field's Cooking School" by Michael Field..
To spare you unnecessary arithmetical speculation, the first three separate amounts of butter in the list of ingredients add up to one half pound, precisely. Divide it into the amounts specified and in a small bowl put aside 10 tablespoons of it to soften to room temperature. Clean the chicken livers carefully, cutting away any green or brown spots, then wash them quickly under cold running water and pat them dry with paper towels. Now cut them each in half. In a large heavy frying pan, melt the first 3 tablespoons of butter. Add the chopped onions and shallots and cook over moderate heat for 5 to 7 minutes, stirring every now and then, until the onions are soft and lightly colored. Mix in the chopped apple and cook 3 or 4 minutes longer. When it is soft enough to mash with a spoon, transfer the whole mixture to the container of an electric blender. In the same frying pan, melt the second 3 tablespoons of butter, this time over rather brisk heat As the butter foam subsides, add the chicken livers. Over high heat, turn them in the sputtering butter with a wooden spoon for about 3 ort 4 minutes. When the livers are quite brown on the outsides and still pink within (cut into one to make sure), remove the pan from the heat and flame them with 1/4 cup of warmed Calvados or applejack. Let the alcohol burn itself out completely. Now add the livers and all their juices to the onion-apple mixture in the blender. Moisten this with 2 tablespoons of cream and blend at high speed, pouring in a little additional cream if the blender clogs. It doesn't matter if the liver mixture finally becomes somewhat fluid but it must be smooth. With a rubber spatula, scrape it out into a fairly fine mesh sieve set over a mixing bowl. Rub the pate through with the back of a large spoon and let it cool completely. Cream the 10 tablespoons of softened butter by beating, mixing and mashing it against the sides of the bowl until it is absolutely smooth. When the liver paste is cool, and no sooner, beat it, little by little, into the butter; if the liver is too warm, the butter will melt and give the finished pate an oily texture. Stir in thoroughly the teaspoon of lemon juice, 1 1/2 teaspoons of salt and a few grindings of black pepper. Fold in the chopped truffles, if you have them, and taste the pate now for seasonings. Don't be over cautious about the salt; since cold deadens flavor, the pate will be surprisingly less salty than you thought after it is refrigerated. 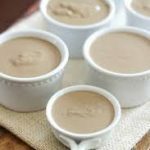 Pack the soft pate into a couple of small earthenware crocks or terrines if you have them; if not, any attractive quart-size glass or pottery dish will do. Smooth the top of the pate with a spatula and pour over it enough clarified butter to cover it completely. This will not only prevent the pate from changing colors as it chills but will make an almost air tight covering that lessens the possibility of spoilage. If you do not use the clarified butter, cover the crocks with plastic wrap. Refrigerate at least 3 or 4 hours, or until the pate is firm, before serving it with French bread, pumpernickel or homemade Melba toast. This is a complex recipe so take your time and be sure you understand each step. It may be difficult but the results are fantastic.